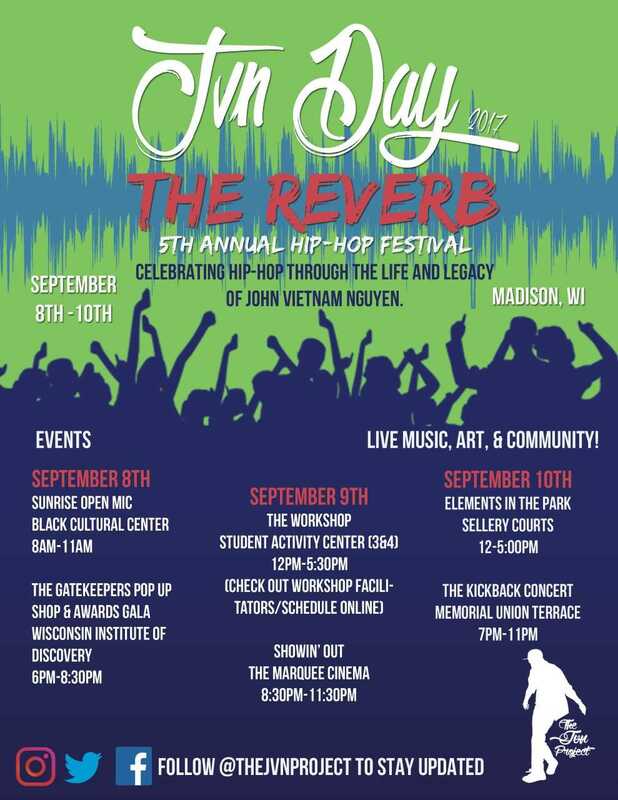 Inspired​ ​by​ ​the​ ​life​ ​of​ ​John​ ​Vietnam​ ​Nguyen​ ​(JVN),​ ​The​ ​JVN​ ​Project​ ​presents​ ​the​ ​5th​ ​annual​ ​J​VN​ ​Day Hip-Hop​ ​Festival:​ ​The​ ​Reverb!​ ​​This​ ​three-day​ ​festival​ ​will​ ​consist​ ​of​ ​six​ ​amazing​ ​events​ ​to​ ​take​ ​place​ ​at different​ ​locations​ ​on​ ​the​ ​University​ ​of​ ​Wisconsin-Madison​ ​campus​ ​and​ ​Downtown​ ​Madison​ ​area​ ​from September​ ​8th-10th,​ ​2017. Engaging​ ​all​ ​five​ ​elements​ ​of​ ​Hip-Hop​ ​this​ ​festival​ ​has​ ​something​ ​for​ ​everyone​ ​in​ ​the​ ​family​ ​to​ ​enjoy! Attendees​ ​can​ ​come​ ​delight​ ​in​ ​commemorating​ ​the​ ​light​ ​of​ ​JVN​ ​through​ ​an​ ​open​ ​mic​ ​at​ ​the​ ​​Sunrise​ ​Open Mic.​ ​​They​ ​can​ ​buy​ ​art​ ​and​ ​dress​ ​to​ ​impress​ ​while​ ​celebrating​ ​members​ ​of​ ​the​ ​community​ ​who​ ​have​ ​used their​ ​leadership​ ​to​ ​uplift​ ​others​ ​at​ ​the​ ​​Gatekeepers​ ​Pop-Up​ ​Shop​ ​&​ ​Awards​ ​Gala.​ ​​ ​​Participants​ ​can​ ​also​ ​take advantage​ ​of​ ​learning​ ​new​ ​skills​ ​in​ ​Hip-Hop​ ​and​ ​related​ ​art​ ​forms​ ​at​ ​​The​ ​Workshop​ ​​from​ ​some​ ​of​ ​the​ ​most esteemed​ ​artists​ ​in​ ​town.​ ​They​ ​may​ ​also​ ​pull​ ​out​ ​their​ ​popcorn​ ​and​ ​pajamas​ ​for​ ​​Showin’​ ​Out,​ ​​a​ ​movie​ ​night​ ​at the​ ​Marquee​ ​Theatre​ ​on​ ​campus.​ ​A​ ​bit​ ​of​ ​campus​ ​will​ ​be​ ​transformed​ ​into​ ​a​ ​space​ ​to​ ​relish​ ​over​ ​what Hip-Hop​ ​truly​ ​means​ ​through​ ​graffiti,​ ​breakdance,​ ​and​ ​other​ ​showcases​ ​at​ ​​Elements​ ​in​ ​the​ ​Park.​ ​At​ ​the​ ​final closing​ ​event,​ ​attendees​ ​can​ ​jam​ ​to​ ​local​ ​and​ ​featured​ ​artists​ ​who​ ​will​ ​rock​ ​the​ ​stage​ ​at​ ​The​ ​Kickback Concert.​ ​​With​ ​their​ ​mission​ ​to​ ​use​ ​Hip-Hop​ ​as​ ​a​ ​tool​ ​for​ ​empowerment,​ ​The​ ​JVN​ ​Project​ ​creates​ ​space through​ ​this​ ​festival​ ​for​ ​effective​ ​engagement​ ​with​ ​and​ ​deeper​ ​understanding​ ​of​ ​Hip-Hop​ ​culture.​ ​It​ ​is​ ​their stance​ ​that​ ​creativity​ ​is​ ​how​ ​we​ ​best​ ​generate​ ​solutions. All​ ​events​ ​are​ ​FREE​ ​to​ ​the​ ​public! To​ ​find​ ​out​ ​more​ ​about​ ​each​ ​event,​ ​how​ ​to​ ​volunteer​ ​for​ ​JVN​ ​Day,​ ​or​ ​support​ ​The​ ​JVN​ ​Project,​ ​visit​ ​us​ ​online at​ ​​thejvnproject.com​​ ​​or​ ​email​ ​​thejvnproject@gmail.com​.​ ​​Don’t​ ​miss​ ​your​ ​chance​ ​to​ ​witness​ ​Hip-Hop​ ​in​ ​it’s most​ ​beautiful​ ​form;​ ​community!​ ​This​ ​festival​ ​will​ ​echo​ ​through​ ​time!